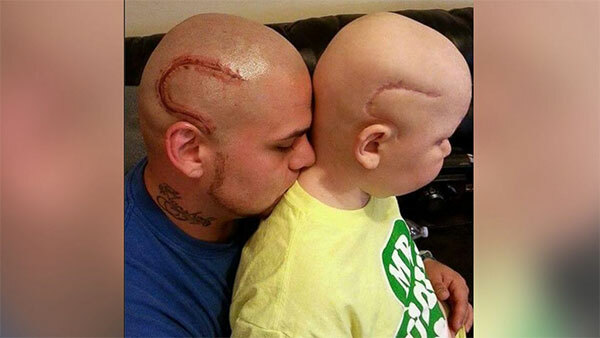 Josh Marshall got a vivid, realistic scar to match his son Gabriel's surgery scar to help the young boy's confidence as he battles a rare form of brain cancer, ABC News reports. Gabriel was diagnosed with anaplastic astrocytoma in March of 2015, and the surgeries to remove his tumor left him bald and with a prominent scar on the right side of his head. "My son was very self-conscious after he got his surgery. He felt like a monster," Marshall told ABC News. Marshall made the decision to get a matching tattoo in August 2015. He says Gabriel loves the tattoo and tells people they are like twins. Though the act was only meant to make his son feel better Marshall also received an outpouring of praise after he entered the Best Bald Dad competition for dads who shaved their heads to support children with cancer. He won first place with more than 5,000 votes. Marshall says his son is doing well, and while a small portion of his tumor remains scans - administered every three months - show it has not grown. Click here to read more on ABC News.